Published in Interactive Investor, November 2011. Original article. In the outskirts of Cardiff is where you will find IQE (IQE), the world’s leading manufacturer of compound semiconductor technology. Grown from crystal and programmed at the atomic level, IQE’s chips are found in a host of cutting edge technological devices, starting with the chip that governs communication inside a mobile phone, on to a host of opto-electronics such as lasers and lights, and all the way to the next-generation solar technology. In the six months to 30 June, £153.5 million cap IQE saw a 16% rise in revenues, to £38.3 million. Pre-tax profits rose by 28%, to £2.8 million, and the group went from having £7 million in debt to a £1 million cash balance. Only 28% of the world’s mobile phones are multi-function smartphones, and this segment continues to grow rapidly. Crack open your mobile phone and you will see a handful of different chips in there, as the constant addition of new functions to mobiles means the phone needs more chips on which to store data. Traditionally, semiconductor chips are made from cheap silicon, but now that devices are becoming increasingly complex, silicon is starting to hit its limits; the amount of data being piled on chips means the physical size is becoming a problem. Compound semiconductors, such as the ones from IQE, are programmed atomically so size is less of an issue. Crystal chips were traditionally too expensive for widespread use, but as we become more demanding about the qualities of our gadgets, the economics of crystal are changing. With a global share of over 30% of the pie, IQE is sitting pretty as the compound semiconductor market grows. “What is happening now is that we are moving towards adding compound semiconductors onto silicon chips. Intel is sponsoring work with IQE to explore this, and we have a number of joint patents filed in this field,” said Dr Nelson, who co-founded IQE in 1988. He adds that Intel believes these new integrated circuits may well become the future of chips, with the first products incorporating the new technology set to see the light of day by 2015. “By using compound semiconductors you can use much less power, and store much more data. Then you can communicate off the chip by optical means,” said Dr Nelson, explaining that today’s system of running band wires from computers will soon become redundant as we start to transfer data optically; today we may think downloading a film in 15 minutes is pretty good, but soon enough this will take 15 seconds. The first we as consumers will see of this speed revolution is Intel’s Light Peak cables, developed in partnership with IQE, which Dr Nelson believes will be launched in six to nine months. He expects the change will be felt more widely in the industry also, as any data volume over 25 gigabytes that has to be moved more than a foot will need an optical solution. “A device the size of your smallest fingernail has the power to project large high-coloured images. The first cameras with pico technology are coming out now, but in the not-too-distant future mobile phones will have these too,” said Dr Nelson. IEQ’s technology has applications across a number of other arenas as well: medically, different-coloured lasers are used to treat conditions such as psoriasis, hair-loss and wrinkles. Crystal chips are also vastly superior to the traditional technology used in the solar power industry; Concentrator Photo Voltaic (CPV) solar represents a very small portion of IQE’s revenues at the moment, but the world market for CPV is expected to see a compound annual growth rate of around 175% over the next five years, compared to 19% for the overall solar market. Posted on 11/01/2011 by Jess. 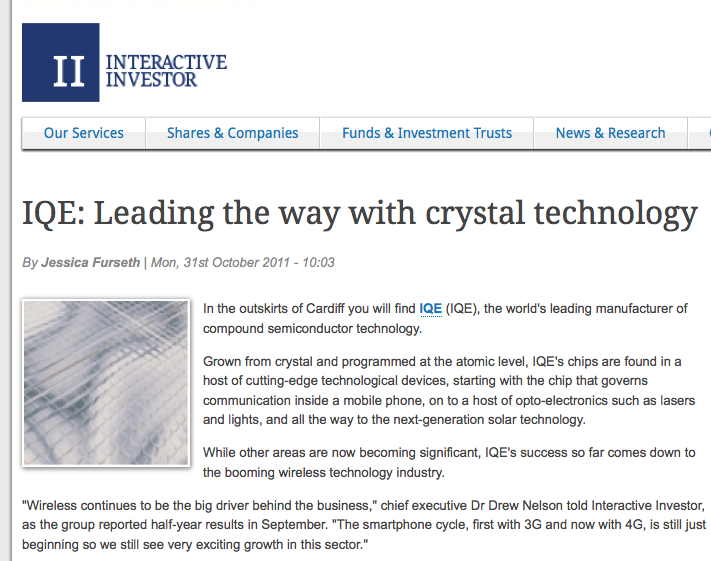 This entry was posted in Technology features and tagged chips, Drew Nelson, interactive investor, interview, IQE, technology. Bookmark the permalink.